If you want a bird that is beautiful, intelligent, active, and very entertaining, a caique (pronounced kai-eke) may be the bird for you. These lively little parrots pack a lot of personality into a tiny bundle of feathers and they're known to be the clowns of the bird world. Caiques have easily made a place for themselves in the homes and hearts of countless bird enthusiasts. The black-headed and white-bellied caiques are the most common of these birds to be kept as pets. Subspecies of the white-bellied caique, specifically the yellow-thighed and yellow-tailed caiques, are becoming popular as well. 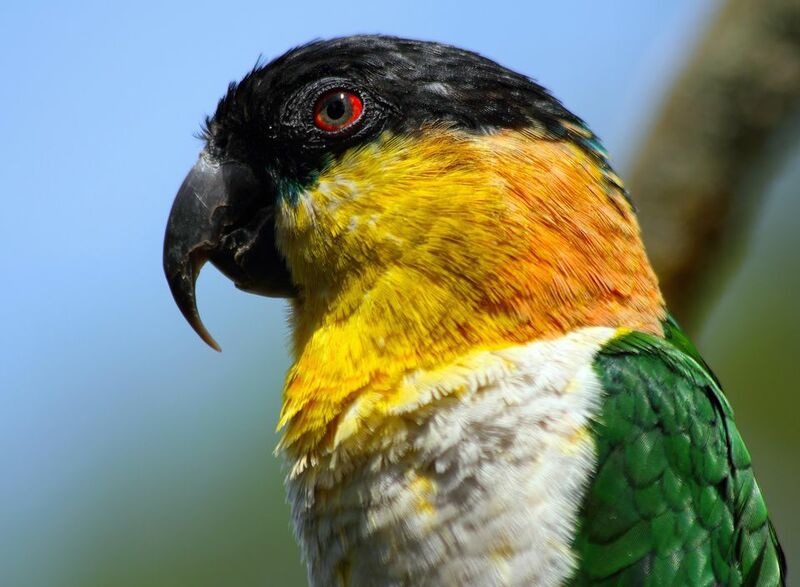 In the wild, caiques call the areas of South America north of the Amazon home. Their range includes Colombia, Ecuador, French Guiana, Guyana, Peru, and Suriname. They can also be found in parts of Brazil and Venezuela. This species enjoys the swamps and tropical lowland forests. Often found in small flocks of about 30 birds or in a pair, they're naturally very social birds and will rarely be seen alone. Caiques are a small- to medium-sized parrot. When full-grown caiques are between 9 and 10 inches in length from the beak to the end of the tailfeathers. Typical of smaller parrots, caiques live about 20 to 30 years in a healthy environment. This is a shorter lifespan than larger parrots who can live 70 years or more. Caiques are known for the strong bonds that they can form with humans. If you're looking for a new best friend, this may be the species for you. They love to show off and are not called the "dancing parrot" for nothing. Quick learners, they're adept at picking up fun tricks that play into their personalities. Caiques are playful, comical little birds who enjoy activities and the opportunity to explore. Always on the move, they're one of the most energetic parrots and quite curious, so they can create a bit of mischief. These birds can also become cranky at times and can nip or, in the least, find ways to use their beak when interacting with people. Some caiques may learn to speak a few words, but most prefer to stick to "bird speak." You'll enjoy their whistles and songs as well as the environmental sounds they mimic. Though they can get loud, they're generally known for a moderate noise level in comparison to other parrots. Caiques usually do well alone or in pairs, but be careful not to cage a caique with a bird of another species. They can become aggressive and deliver surprisingly harsh bites. The markings of a caique are distinct. Rather than the hints of color here and there seen in many other parrots, caiques have more of a color-blocked look. Their heads, wings, bellies, and thighs tend to be a distinct color from other body parts with few gradients between the colors. This is why they're sometimes called the seven-color parrot. Black-headed caiques have mostly blackheads with orange or yellow cheeks and a green streak under their eyes. Their wings and upper tailfeathers are a beautiful green and the thigh feathers and underneath the wings is a bright yellow. They have a beige to the white abdomen with gray legs and a gray beak. White-bellied caiques have orange and yellow heads with green wings and tails. They too have yellow underneath the tail feathers and on the thighs. This bird gets its name from the white abdomen and sports pink legs and a horn-colored beak. In general, a caique would be a good choice for a family or person that wants to keep a pair of birds. They are not known for being especially friendly with other species but easily form bonds with humans who show them adequate love and attention. They can be quite affectionate and enjoy time playing with the human companion or just sitting with them. Caiques must be given plenty of play time, and must certainly be showered with lots of positive interaction. They are usually able to entertain themselves for short periods of time, making them a good choice for working bird owners. They are also relatively small, which makes them appealing to those who dwell in apartments and condominiums. Despite their small size, caiques will do best in a large cage or small aviary. Their busy-body nature means they need lots of room to play and plenty of stimulating toys. Since they are intelligent, they also make pretty good escape artists. Ensure their cage is well-constructed and can keep these crafty birds safe, even if they try to chew the bars. Although caiques are not known to be particularly loud birds, they can and do emit calls that are very high-pitched and shrill. It would be a good idea to visit the caique that you are thinking of bringing home so you have a good idea of their vocal abilities. With a lifespan of 20-plus years, you will want to ensure that you can handle their vocalizations. Caiques do best on a fresh diet of nutritious fruits, vegetables, nuts, and beans. This should be supplemented with a high-quality diet of extruded pellets. As with all bird species, clean, fresh water should be made available at all times. Leafy green vegetables like Swiss chard, watercress, kale, or collard greens are nutritious additions to their diet. Fresh fruit makes a wonderful topping for the veggies. A dash of healthy seed such as chia seed here and there is fine but refrain from an all seed diet as it will have dire consequences. Diversity is key to ensure the birds get all of the vitamins and minerals they need. Caiques are active little birds and are unique in the fact that they seem to prefer to walk more often than fly. A caique should be given a minimum of one hour outside the cage each day to hop around, exercise his strong leg muscles, and do a bit of supervised exploring. Care must be taken to provide a caique with plenty of toys so he can exercise his beak. This play also helps wear down his beak which helps keep it in good shape. Branches and toys should be rotated regularly as they become worn out and it may take some time to find your bird's favorite toys. They can be rather finicky and stubborn about their things. Caiques enjoy floor time. You will enjoy watching them on the floor or any large flat surface because they have a unique "hop" that is charming and endearing. They appear to be a windup tin toy that hops along in a very amusing way.